Food plays a vital role in our health and in that of our pets. To have a happy, healthy cat, the correct foods need to be provided from an early age. Feline nutritional science has made great advances. Commercial foods are now available to supply balanced diets for kittens through to old age cats. As with many things, excess and deficiency are both harmful. You should be aware as to the qualitative and the quantitative needs of your kitten, which are quite different from those of a dog. Cats need some 50 nutrients in order to remain healthy. Deficiency in any one of these nutrients sets off a chain reaction resulting in poor health. 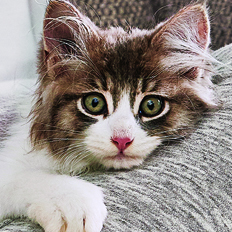 A cat’s daily requirements depend on their physiological status (growing or adult, pregnant or nursing) and reproductive status (desexed or not). Proteins constitute the framework of body tissues and are made up of chains of molecules known as amino acids. Cats are unable to make arginine and taurine – two essential amino acids. Taurine deficiency for example can cause blindness and heart problems. Lipids or fats are composed of fatty acids. They provide energy and contribute to cell membrane structure. Once again, cats need certain so-called essential fatty acids that are only found in meat and fish. Carbohydrates or sugars also supply energy. They can also help gut function through supplying fibre. Vitamins and minerals need to be present in sufficient amounts but not to excess. With homemade food, be especially careful not to give too much liver, which is rich in vitamin A, the continual oversupply of which can lead to serious bone abnormalities (e.g. fusion of the vertebrae in the spine). The need for meat in a cat’s diet throughout its life is essential. Kittens require more protein than adult cats for their growth and development. They also have higher energy requirements. For this reason, kittens need a higher fat supply in their diet. Special kitten foods meet these requirements. Pregnant cats also need more energy-rich foods. Adults do well on ‘maintenance’ rations, although sedentary or desexed cats may tend to become obese. This is why specific ‘light’ foods have been developed. There are specifically prepared commercial diets available for each stage of your cat’s life. Your veterinarian can advise you on the appropriate nutritional needs of your cat. Cats, unlike dogs, are ‘grazers’. They prefer to have several smaller meals a day. They also eat at night, unlike dogs. Ideally the food bowl should not be too deep: dog bowls are not suitable. The level of water or food needs to be full enough as cats may not drink/eat if their whiskers are touching the sides of the bowl. Remember to always provide cool, clean drinking water for your kitten. Some cats may not eat next to where they drink, so it may be beneficial to provide a water source at a distance from the food bowl. Otherwise you may see your cat drinking from the pot plant dish, the dog’s water bowl or a dripping tap. For your own peace of mind, and for your kitten’s weight, do not let them climb up on to the table during mealtimes and never feed them from your own plate.